BINUS UNIVERSITY is delighted to announce its partnership agreement with Nanjing University of Information Science & Technology (NUIST) as a Memorandum of Understanding (MoU) has been signed between the two universities on Tuesday, 26 May 2015. 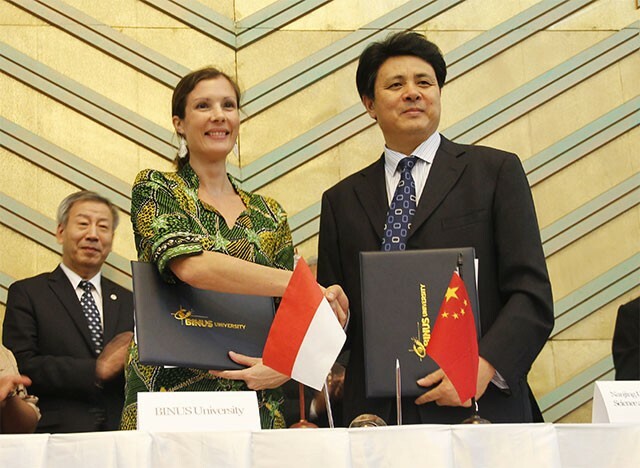 The agreement-signing ceremony took place during the China-Indonesia University Presidents Forum at the Directorate General of Higher Education (DIKTI), Ministry of Education and Culture. The MoU was signed by Karen Imam, Director of BINUS Global and Prof. Li Gang, Vice President of Nanjing University of Information Science & Technology. The cooperation program aims to foster advancement in teaching, student mobility, research projects, cultural understanding, as well as international reputations of both institutions through the various programs both institutions agreed to discuss upon. Founded in 1960, Nanjing University of Information Science & Technology (NUIST) is one of the key institutions of higher learning in China. Located on the north of Yangtse River and in the heart of the Industrial Zone of Nanjing High Technology, NUIST is recognized as one of the well-known leading research and teaching institutions. The university has a complete higher education system with undergraduate, postgraduate, doctoral programs as well as a scientific research center for post-doctoral students. NUIST has 50 undergraduate majors covering 8 main subject categories, namely science, engineering, management, literature, economics, law, agriculture and art.